Here's a case where you are trying to fix network issues at a place and you need to access the router's browser interface. Some of us have been in that situation, fruitlessly pecking in combinations of 191.178.x.x. Unless you have every default router address tattooed on your forearm, you'll eventually encounter one that stumps you and leaves you with the word, "oh Jeez!" If you encounter that, you can typically find the information with a simple command on Windows or macOS. Open the command prompt (Start > Run > 'cmd') and then enter ipconfig. 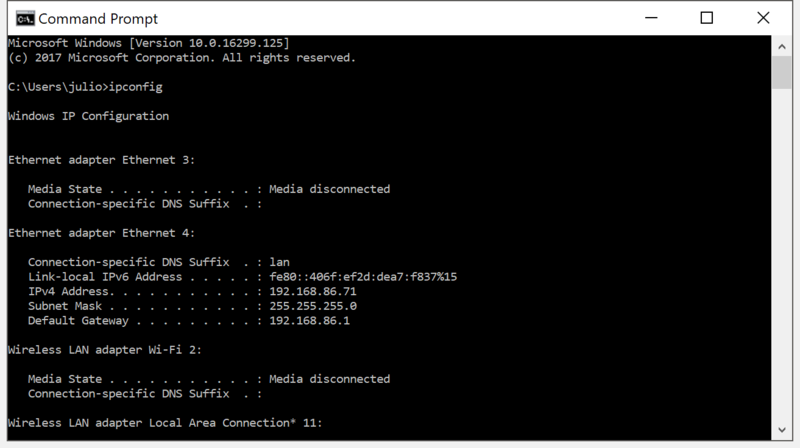 The address you need should be next to Default Gateway under your Local Area Connection, and it will often begin with 192.168.... On a Mac, the information is easily found under network options, or using the Terminal, use the command netstat -nr | grep default. If for some reason you can't retrieve the router's IP address using that method, we've compiled a brief list of popular router brands and their common default addresses. The list includes most router manufacturers with more than a dozen or so models, particularly if they deviate from the standard 192.168.1.1 address. Below are some list of common default IP addresses. If you couldn't find your router brand above, or the most common default IPs are not working for your model, we recommend you check out RouterIPAddress.com or SetupRouter.com for more IP addresses. Likewise, if you're looking for default usernames and passwords, Router-Reset and PortForward should have you covered. Common default usernames include variations of admin (Admin, administrator , etc. ), and the password is often admin, password, or simply left blank -- needless to say, it's good practice to change these during the initial setup.